The PS4 outsold the Xbox One at US retail. As both consoles launched to great fanfare, the question on everyone's mind was, which would outsell the other? Well, the answer's in: the PS4 outsold the Xbox One in the US, thanks in part to launching a week ahead of Microsoft's console. 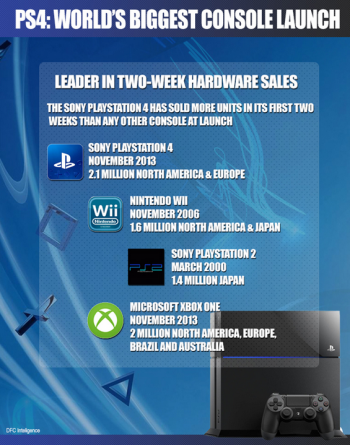 The PS4 has had the best console launch of all time, in terms of total hardware unit sales, says analyst DFC. Xbox One claims more than 2 million units sold worldwide, which includes US retail sales of over 900,000 units during its first nine days on the market. At the height of the frenzy, Microsoft sold over 100,000 units per day in the US. However Sony's PS4 sold 2.1 million in North America and Europe - over 1 million sold in North America within 24 hours - making it the US retail top seller. "Thank you for making the PS4 the biggest launch in PlayStation history," says Sony. The US retail top 10 title list is pretty much as you'd expect. The only mild surprise - and not much of one - is Grand Theft Auto V which, appropriately enough, holds the #5 spot on NPD's chart. It's the only game in the top 5 that isn't available on either of the two new consoles. It's insanely popular, granted, but to still hold a position in the charts when two major consoles are smacking each other around with launch titles is an achievement in itself.